Ian Poulter hits a lovely second-shot iron into the green on the par-five second, maybe 25 foot for his putt. Justin Thomas is not far off that though behind him. Jon Rahm’s third shot is a precise bomb right down on the flag. Another round of Icelandic claps, started from the stewards on the grandstand by the fifth. But they soon turned to American hollers when Tony Finau chipped in from the bunker. Cue Rory McIlroy to restore European chanting rights. Matt W:Can one of the vice captains please get the message to Jon Rahm, it’s easier to play from any fairway, first cut or the hay than it is the water. Thank you. David:Can’t USA have an away kit that doesn’t clash. Get it sorted for next time. Daniel:Why are Europe in Red and USA in Blue? I’m getting very confused whose playing shots. it makes the call believe in blue a bit of a joke too. I think we went with burnt orange/rust when describing the European colours earlier Daniel. I wonder if all those missed putts from yesterday are taking their toll on Dustin Johnson and affecting him psychologically. He missed a lot of those from inside 10 feet and it’s between the ears that makes you stand out. There were lots of lessons to learned from yesterday but perhaps one from Rory McIlroy’s point of view, is that he responds to having an older head next to him rather than a rookie. He flourished with Ian Poulter rather than Thorbjorn Olesen and he’s got that bounce back in his stride next to Sergio. After sweeping a lovely approach to within 10 feet, the Northern Irishman responds to Tony Finau’s delightful chip in from the bunker by nailing a 12 foot putt for birdie. Rory roars in delight as he halves the hole. C’mon son, that is vintage McIlroy! Paul Casey provides the jam to go with the cream (on his scone, of course) as he follows up his approach on four with a birdie putt from 10 feet to put Europe one up. He gobbled up that chance as if he was enjoying a Cornish tea in St Ives. Francesco Molinari’s eagle putt to win the hole is on it’s way, it’s tracking on line, lovely weight, just drifts off at the end. It is only a tap-in for a four though. Tiger Woods has a snaking 20-footer of his own to try and salvage a half. A mis-read. The American saw a slope that was never there, setting it out and never getting the boomerang back. The United States are in strife on the third as well. Patrick Reed is messing around amongst the wildlife in the rough and Tiger Woods had to chop out sideway after an errant tee-shot. Tommy Fleetwood is also wet and wild, but Francesco Molinari is looking solid as doctor’s desk. He is on the green in two and a makeable eagle putt of about 20 feet. Back on the par-four fourth, Paul Casey has struck a sweet second shot to within 10 feet. Rickie Fowler cannot find the green. Dustin Johnson is having a shocker. 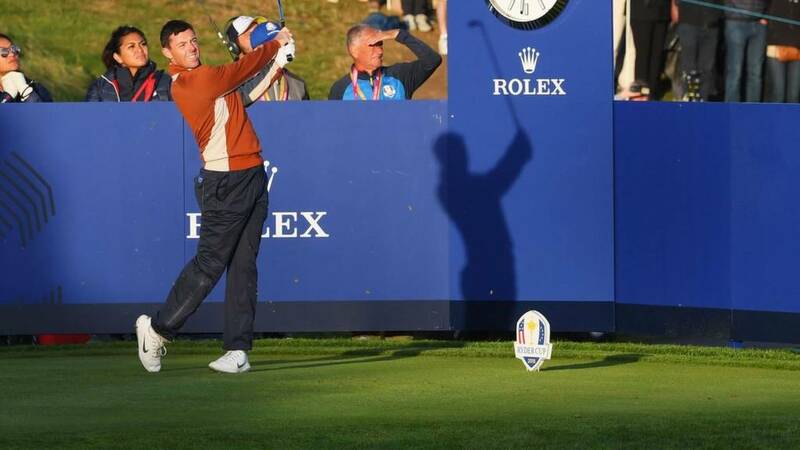 Former Ryder Cup winner Jamie Donaldson, speaking on BBC Radio 5 live, reckons the world number one would be about six over par through four holes, if he was playing stroke play. No mistake from Jordan Spieth as he rattled away his putt from three feet or so. A first bit of red on the board today. Jordan Spieth has gone close, within-10-foot close, off the tee on the par-three second. Jon Rahm is in the drink though. Ian Poulter’s birdie putt from distance comes up a good eight feet short. Spieth to putt for the hole. He might get two shots at it as well with Poulter having plenty to do. Onto the fifth for the opening group. Rory McIlroy and Tony Finau straight down the fairway on the par-four hole called Plein Gaz. They both gave it some. The United States’ turn off the tee on the par-five third. Patrick Reed follows Tommy Fleetwood into the water. Tiger Woods is wide on the other side of the fairway and it looks jungle-y out there. Francesco Molinari is the best placed after one shot certainly. Now then. We were hoping for a Sergio birdie on four, but with Tony Finau and Brooks Koepka missing par putts, Garcia doesn’t even need to take it on. Tommy Fleetwood, perhaps a little hyped after landing that putt on the second, splashes into the brook off the third tee. The Italian responds with a lovely faded blast down the middle. All hail Tommy Fleetwood, oh to touch the hem of his white bobble hat! The English rookie slides the ball into the hole from 20 feet as casually as if he is out shooting the breeze on the putting green. The first full-throated roar from the gallery following this match. Rickie Fowler’s eagle putt from 25 feet on the third cannot find the hole but it’s enough for birdie. Paul Casey was actually off the green from a similar distance and opts to chip, but is equally accurate. Sergio is squinting into the sun as he lines up his second on the fourth, a 190 yard approach to the green. But his focus is unstinting. He rips the shot to within 15 feet. Meanwhile, Brooks Koepka is in the first cut of rough and duffs his ball out across the fairway. I speak from experience, but that was ugly.